Studio Carry On Harry , Singapore invited Nayaswamis Jyotish and Devi Spiritual Directors of Ananda (to give some insightful talks about Yoga and Meditation to raise our Consciousness and why it is important in todays time.Nayaswamis Jyotish and Devi are Spiritual Directors of Ananda, a global movement of spiritual communities, centers, and meditation groups-people living the change they want to see in the world. Guided by the teachings of Paramhansa Yogananda, Ananda will celebrate its 50th anniversary in 2019. Paramhansa Yogananda lived (1893-1952) through two world wars. Image removed by sender.He taught yoga, meditation, and practical ways to uplift consciousness in the U.S. during a time of great upheaval-World War II. Like Buddha, Gandhi and the Dalai Lama, Yogananda taught universal spiritual truths. His best-selling book, Autobiography of a Yogi, sparked a spiritual revolution of yoga and meditation in the West. If you could talk to Yogananda today, what would he say about the challenges we face? Nayaswamis Jyotish and Devi are dynamic emissaries of Yogananda, bringing his teachings into focus for today. "The challenge of our world, and our lives, is a precious spiritual opportunity. Let us raise our consciousness to the occasion," say Nayaswamis Jyotish & Devi. "By choosing the light, we can lead the world to happiness." Nayaswamis Jyotish & Devi articulate Yogananda's teachings and shine light on the real solution for today's anxiety: raising our consciousness. Live online and in person, the spiritual teachers will be speaking to thousands gathering in the San Francisco Bay Area (April 1), Los Angeles (April 29), Seattle (June 9) and Portland (July 21). "If we understand the bigger picture of where happiness fits in, not only for ourselves, but for the world at large," says Nayaswami Devi, "then when we begin to bring that higher consciousness, we become extensions of these great Masters." • In response to Yogananda’s direction to create “World Brotherhood Colonies”, one of his foremost disciples, Swami Kriyananda founded Ananda in 1968 in the Sierra Foothills. • Ananda Village was the first World Brotherhood community, and continues as the spiritual heart of Ananda Worldwide. There are now 7 communities…in Seattle, WA; Portland and Laurelwood in OR; in Sacramento, Palo Alto and Nevada City, CA; in Assisi, Italy; and in India.Ananda will celebrate its 50th anniversary in 2019. 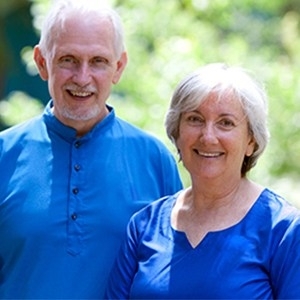 • At Ananda Village you’ll find over 200 people living the yogic life, plus two beautiful retreat centers, the Ananda School of Yoga and Meditation, and many pilgrimage sites for deep meditation and renewal. How can practicing meditation raise consciousness? • Meditation can prevent conflict. When we bring harmonious energy to a situation, we see harmonious choices and can act to de-escalate the anxiety of others around us. • We’re teaching people to step back from conflict and confusion, meditate first, and then choose an action that generates peace and harmony in the world. • Together we’ll radiate a million hours of peace and harmony into the world. How can our listeners hear your upcoming talks? • In Portland, OR on July 21stat the historic Multnomah Hotel where Yogananda once spoke, we will talk about “A World United”. Who are some people our listeners might recognize who practiced Kriya Yoga? • Mahatma Gandhi practiced Kriya Yoga, and was initiated by Yogananda himself. He lived a life completely devoted to change from within, radiating peace and harmony, as Yogananda taught. • The Beatle, George Harrison, was a disciple of Yogananda and practiced Kriya. He put pictures of Yogananda, and his line of gurus on the cover of Sergeant Pepper’s Lonely Hearts Club Band album.